Fit-Ink: Twin Cities vs. Chicago, Who Wins? If you were looking to run the Bank of America Chicago Marathon but couldn't sign up in time (the race closed less than 55 days after it opened on Feb. 1, 2010), chances are you found another Midwest race to meet those fall marathon goals. Two such races--Twin Cities in Minneapolis and St. Paul, Minn., and Lakefront in Milwaukee, Wis.--near and somewhat dear to my heart took place this weekend and offer some of the same charm as the Windy City's race but also enough variation for anyone who decided long ago that Chicago wasn't the place to run a marathon. And being that I become rather obsessed with races, results and marathons this time of year (oh and the Ironman World Championships), I had to give a shout-out to my husband's hometown and the spot where he might be working next year. While you'll have to wait 'til next year to run these two races, that doesn't mean you can't learn a little more about them almost a year in advance. In fact, it might actually help solidify monumental marathon decisions: where to run, when to run, should you run. So we're taking a look at some of the reasons to run these other two Midwest races that have found spots in the hearts of the Chicago running community. But first up, the Twin Cities Marathon (the two races needed their own posts). 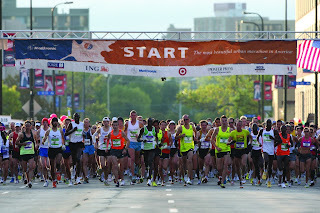 This race has been held either the weekend before or the same day as Chicago, and both scenarios can work in the favor of Chicago runners. You can still train with your friends, just race in a different state. And you could end up with better weather. If you take a look at weather.com's forecast for next Sunday and then the real-time temps for today, you might wish you're running 26.2 now instead of next week (depending on your ideal running temperature). And being that you're north of the Windy City in Minnesota, you're also more than likely to find chillier temperatures what you'll find close to home or could avoid a weather front that's heading toward Chicago. Smaller scale. Not into running with 45,000 of your "closest" friends? This race was capped at 11,200 runners. While the spots were gone by early June, that's still more registration time than Chicago had this year. Scenic. You'll run a tour of the two cities starting at the Metrodome and finishing at St. Paul's Capitol Building. It may not be an out-and-back or a traditional point-to-point (Boston, California International) but consider it a better option since you're not shuttled 26 miles to the race start. Get the family and friends involved. You want to run a marathon. Your support team and/or friends want to participate too, but not for 26.2 miles. Twin Cities offers a weekend of running with the marathon and a 10-miler held on Sunday and a 10K, 5K and family events on Saturday. If you're into running races when the race itself is celebrating a milestone, then this is definitely one to consider for 2011. The Twin Cities Marathon will celebrate its 30th running next October. Flat and rolling course characteristics help produce Boston-qualifying times for several runners. And fast times for the elites too--Deb Buzunesh, a 23-year-old from Tampa, just topped the female results with a 2:27:24. And for the elite American runners, it's a chance at a payday. Chicago, Boston and New York will have the fast feet from Kenya, Ethiopia, Russia and more, who will eventually go on to top the results lists. In Minnesota--if 2010's men's race is any indication--it's all about the American runners, or at least those who reside in the states. Deba Buzunesh, a 23-year-old Ethiopian from Tampa, Fla., won for the women, while Sergio Reyes, a 28-year-old from Palmdale, Calif., topped the men's results with a 2:14:02. Have you run the Twin Cities Marathon? What did you like or not like about it? Photo grabbed from meetminneapolis at Flickr. Hey! I have never done Twin Cities (MN) or Milwaukee, but they sound super! Can't beat Chicago though, right? :) Are you running? Totally agree--you can't beat Chicago! That's probably why I keep signing up for it (this is my 11th year!) After seeing Sunday's forecast this morning, I kind of wish that I had registered for Twin Cities or Milwaukee. I'll look for you on Sunday morning and good luck!